Would you like to hold your event in a hotel, with beautiful grounds overlooking the sea, with the food provided by the top caterer in Israel – and, in addition, have the FREE services of an event organiser? Anglo israel Events have been given the exclusive rights to offer this unique package to clients. The hotel has amazing grounds, and the location for the Chuppah is stunning, situated on a deck, with unobstructed views of the sea. The reception, dinner and dancing can also be held outside, depending on the time of year. 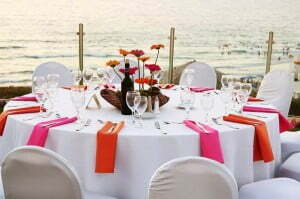 The banqueting hall also overlooks the sea, and is suitable for small or large parties. The caterer is considered the best in Israel – the food is gourmet kosher, the menu totally mouth-watering, and the service impeccable. In addition, you would receive the free services of Anglo Israel Events, one of the top event organisers in Israel, established by an ex-Brit in 1994. Anglo Israel Events would oversee, advise, co-ordinate and supervise all the arrangements, advising on the most suitable suppliers for your event, and being in attendance at the actual event…………and their services are completely free of charge!!! Please contact Joan for further details of this unique offer.